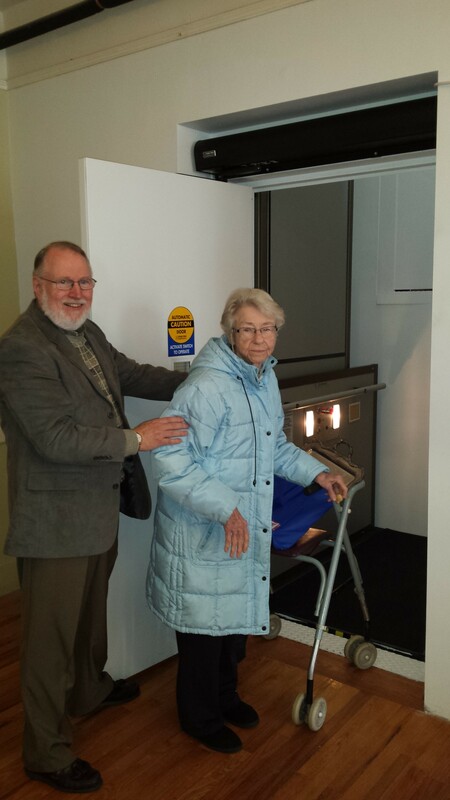 April 25, 2014 Alice Collins Accessibility, Construction, Worship Comments Off on Our New Lift! Duane Stinchfield helps Sonya Hawkins onto the new lift. for lending his help with the construction, Debbie Dunbar for staying on top of the continual accumulation of dust and debris during construction and to all of the Trustees for their support and assistance. We also thank Don Lemon, the state inspector who came on short notice to complete the inspection so that we would be operational on Easter Day. It was wonderful on Easter morning to have Sonya and Addie and Elizabeth in the sanctuary to worship with us. They are just some of our members who have not been able to be with us or have been watching services from a live feed to the main floor for many weeks.